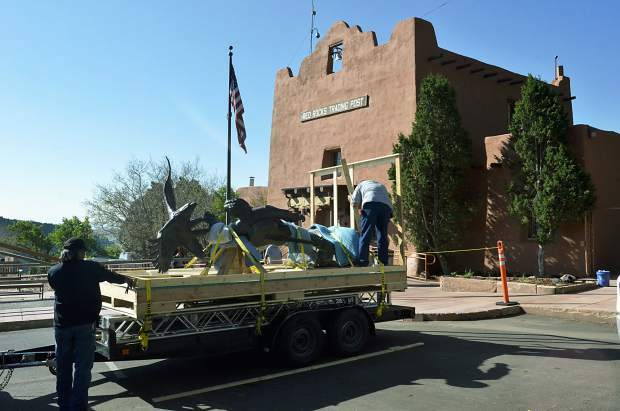 Workers transport the 'Spirit' statue of John Denver to Red Rocks on Thursday. The John Denver “Spirit” statue was successfully placed at its new home at Red Rocks Amphitheater on Thursday, but other preparations were delayed by rainy weather Friday. The statue, 15 feet tall and weighing 1,500 pounds, was placed outside the Trading Post, the new home for the Colorado Music Hall of Fame. It will take about a week to complete the stonework around the base, put in a plaque and undertake other tasks, said Colorado Music Hall of Fame Director G. Brown. “We were going to have the statue polished (Friday), but it’s a downpour in the foothills,” he said. “Spirit” has already been a hit with Denver loyalists, Brown said. Many fans have already made the pilgrimage to Red Rocks to see the statue even though all the work isn’t complete, he said. The statue was erected at the Windstar property in Old Snowmass in 2002. The property was sold and “Spirit” was removed in September 2013. The statue was donated to the Colorado Music Hall of Fame and put into storage. The hall moved from Broomfield to Red Rocks this spring, so the statue was reinstalled. Denver was the first inductee to the hall of fame, which features a big display on the popular singer-songwriter. The Windstar Foundation was founded by Denver. The nonprofit pursued environmental and humanitarian causes. It languished after he died in 1997 and was dissolved in 2012.